FORT CAMPBELL — For soldiers and military families dealing with pay issues, Fort Campbell’s latest improvement does a lot more than add another building to the inventory. The new facility, called the Defense Military Pay Office, puts all pay operations for soldiers stationed at Fort Campbell under one roof that houses the disbursing, customer service, processing and reserve pay sections. The 31,000-square-foot facility considerably streamlines what was heretofore a clunky process, run out of five temporary buildings that were not much improvement over the converted WWII-era barracks they replaced. Additionally, the building also houses the Defense Military Pay Office management and staff — civilian and military — making command and control a simpler process for leadership as well, according to DMPO Director Maj. Thaddeus Burnett. 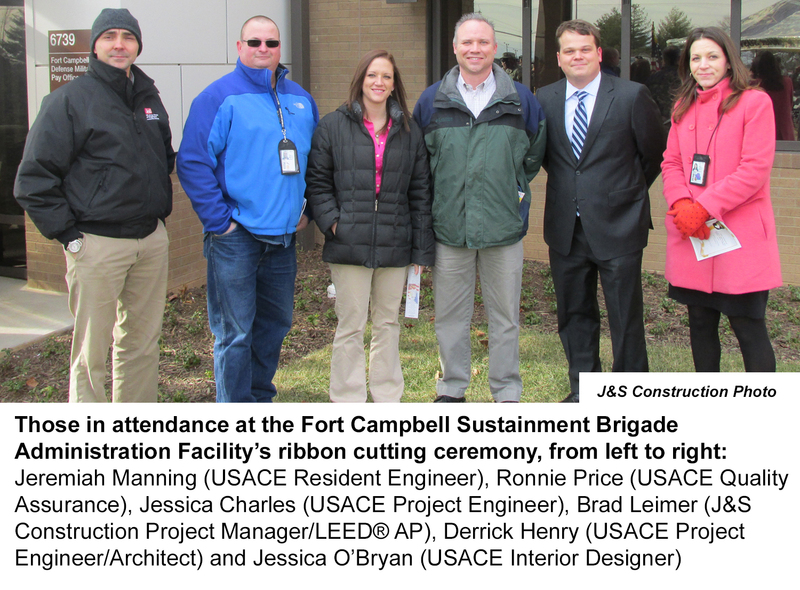 “It’s a 100 percent improvement all the way around,” said Burnett, who was equally excited about the design features of the building that make it one of Fort Campbell’s most energy- and resource-efficient structures. The facility features geothermal heating, solar windows that maximize natural light and a special type of pavement outside that allows water to seep through to a reservoir under the building. Called “pervious” pavement, the innovation allows all stormwater to be retained for use in flushing commodes as well as providing a potable (drinking) water backup, reducing normal water use by 41 percent. Geothermal heating uses the earth as a heat source in winter and a heat sink in summer, reducing costs of both heating and cooling systems. And solar hot water heating, using energy collected from rooftop solar panels, provides 30 percent of the hot water used. Lt. Col. Abel Young, acting commander of the 101st Sustainment Brigade, said that designers from the U.S. Army Corps of Engineers ensured that no “green” feature was overlooked, resulting in a building that meets LEED (Leadership in Energy and Environmental Design) gold certification standards. View link of news article.